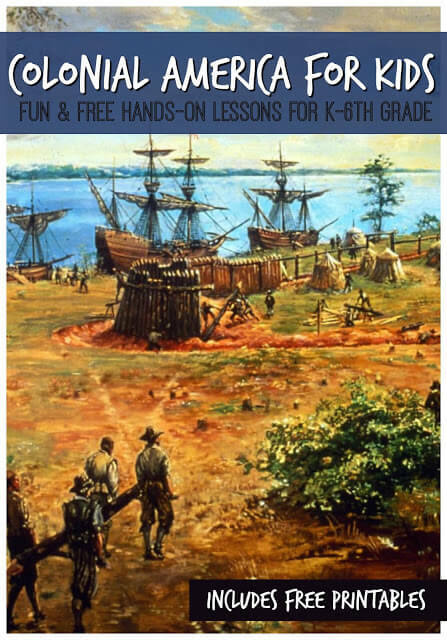 Teach kids what life was like for America’s first early settlers with this fun, memorable, hands on Colonial America for Kids unit. You will love all the creative educational activities that make history come alive in our History for Kids units. This fun, hands-on unit will make it fun for elementary age kids to learn about what life was like for American early settlers. Kids will explore their homes, food, art, and differences in the original 13 colonies. Plus, this fun history unit is FREE! I hope your family has fun learning about history together. Start off our Colonial America for Kids history unit with a look at the first permanent English settlement in America – Jamestown. Lots of hand on projects like eating Gruel, making a Wattle & Daub house, and creating a tin lantern will make the settlement come alive. Also included are free worksheets, writing prompts, and book recommendations to round out your unit on Jamestown. This lesson is perfect for our lesson on Colonial America for Kids, but would also be fantastic in November when learning about the Pilgrims and the first Thanksgiving. Kids will have fun making costumes, learning how Squanto taught the settlers to plant crops, writing with a quill, making Johnny Cakes, and making a traditional colonial toy – marbles! Round out your week with some great book recommendations and free colonial worksheets. Learn about Dutch & Swedish settlers in America, make homemade butter, build a log cabin , read some fantastic historical fiction, and complete free colonial worksheets. Dive into this weeks lesson as you learn about William Penn who founded Pennsylvania. Kids will enjoy making traditional silhouette art projects, a colonial punishment stock, and more. Round out your week with some fantastic books and free colonial worksheets.